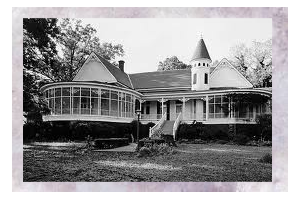 dgewood Plantation aka Baughman House was built in 1902 by Jefferson Davis Baughman. It is a Queen Anne victorian style home with a bell tower and/or turrant nestled on eight plus acres among many beautiful towering trees. Its significant period was 1900-1924 and it is registered with the National Register of Historic Places. The home is located one mile west of Farmerville, Louisiana on Hwy. 2. The home originally had 13 rooms with high ceilings and hardwood floors, with beautiful crown molding detail. who was the last one to reside in the beautiful home and passed away in the late '70's. After her passing the home begin to deteriorate little by little. After years of the home being unkempt, the structure worsened. The beautiful old home disappeared into the woods, where when passing by, all you could see was the tip of the rooftop. When Pat and Kay Carroll purchased the home in 2010 it was almost hopeless, but thanks to the skills and history of Pat's background he and Kay starting putting it back together again. What you see now is totally breathtaking! Pat and Kay have restored this landmark. or to stop by to visit. Sometimes we even hear stories from others about their visit to this home when they were children. Our dream was to build a bed and breakfast that would offer that Southern hospitality while bringing this big old home back to its grandeur. The Carroll's opened the bed and breakfast in February of 2012. Its new features have been created at great lengths yet the original integrity of the home has been maintained. Pat and Kay are both long-term residents of Northeast Louisiana and would love to have you come for a visit and see the beautiful renovations. 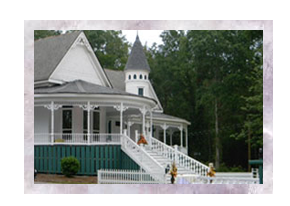 Edgewood Plantation is a Smoke Free Bed and Breakfast. All rights reserved. Website by Designs By Kacy.